The RDX® QuikStation™ is a network-attached highly flexible removable disk appliance for automated data protection, disaster recovery and archiving. The RDX QuikStation is designed and manufactured by Overland- Tandberg to be enormously flexible while being simple to set up and manage. The onboard multi-language, web-based management console provides remote configuration, control, security, and management from a standard browser. The iSCSI connectivity of RDX QuikStation enables an easy integration into physical and virtual environments as well as hybrid cloud storage architectures. Providing multiple operation modes for disk volumes, removable disk, LTO tape automation* or a combination* of disk and tape results in most versatile data protection solution. For high performance and resiliency, the QuikStation 4 provides two bonded Gigabit Ethernet (GbE) ports with load balancing and failover capabilities. QuikStation 8 is equipped with two 10 Gigabit Ethernet ports. The RDX QuikStation is built on the award-winning RDX removable disk technology. The rugged RDX media needs no special care and is ideal for daily use in office environments. Full forward and backup compatibility between media and drives ensures unrestricted usage and investment protection during the entire media lifetime. The RDX QuikStation 8 provides 8 integrated RDX drives. Combined with Tandberg Data’s 5TB RDX media, the system provides up to 40TB of online capacity and unlimited offline capacity. QuikStation 8 is equipped with 2 x 10GbE port for maximum performance requirements. It offers protected modes for spanned disk volumes with a fault tolerance of either 1 or 2 RDX media to ensure full data availability. 1 hybrid configurations that offer a combination of a LTO StorageLoader and 4 RDX targets. The RDX QuikStation 4 provides 4 integrated RDX drives. 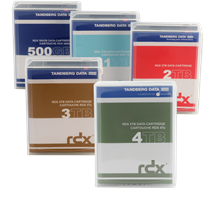 Combined with Tandberg Data’s 5TB RDX media, the system provides up to 20TB of online capacity and unlimited offline capacity. Highly flexible removable disk array for automated data protection, disaster recovery and archiving. QuikStation 4 is equipped with 2 x 1 GbE port for maximum performance requirements. It offers protected modes for spanned disk volumes with a fault tolerance of either 1 or 2 RDX media to ensure full data availability.